On November 30, 2012, the FCC released long-awaited new rules for low power radio stations. Overall, the Sxith Report and Order is a great victory for community radio, with more flexible rules about where stations can be located and stronger preference given to local, community-driven stations. Many of these new rules were the result of tenacious advocacy from Prometheus and our supporters. In late 2012, the FCC announced that they would begin accepting applications for new low power stations on October 15, 2013. At last! But we know that the FCC's predictions on timing aren't always set in stone (to put it mildly). So what are the steps ahead before the FCC can accept new applications for community radio stations? The biggest task ahead is that the FCC must deal with a backlog of pending applications for FM translators. These are repeater stations that extend the signal of existing radio stations. This is the issue most likely to affect the timing of the low power radio filing window. Thousands of translator applications have been on hold at the FCC since 2003. To save room for low power radio stations in urban areas with limited spectrum, the FCC will be dismissing many of these translator applications. "Takoma Park Resident Tries to Bring Community Low-Power FM Radio Station to Her Area"
Clergy and people of faith tell FCC to keep low power radio local! On Thursday, October 11, 2012 Prometheus welcomed supporters, local partner organizations and friends to our new offices in Center City Philadelphia. Prometheus is pleased to welcome Julia Wierski as the new Director of Development and Communications. Julia joined Prometheus in October 2012 after several years of working with the organization. In 2010, she worked on encroachment notification for LPFMs, and more recently she worked with our Policy Director, Brandy Doyle, as a campaign associate. 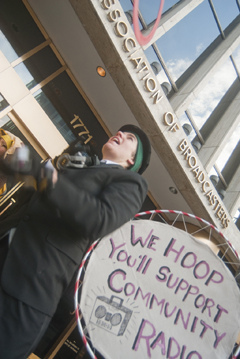 Community radio has been a hot topic at conferences across the country this summer. Here's our reportback on with the highlights from recent convenings. We are very excited to announce the public launch of the beta version of Rfree, a free and open source software developed by Prometheus Radio Project with support from the Media ideation Fund at ITF and Coast FM. This web-based software offers technical support for Low Power FM (LPFM) applicants.